6-Ft Life Size Standing Ghoul Bloody MAN EATER Creepy She-Devil Undead frightening female Zombie will make even the walking dead run for cover! 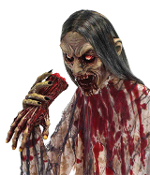 Bloody scary rotting appearance gives a haunting look, as she seems to be gluttonously gnawing on a skinned arm. She is literally a Man Eater, that’s for sure! 6 foot (180cm) tall, standing decaying blood spattered zombie woman she-monster prop that eats human flesh. Her disgusting face is twisted in ravenous rage, and features long unkempt ratty hair. Best of all, her poseable arms hold a severed hand, as she gnaws upon it for a most recent meal. You’ve gotta ‘’hand’’ it to whoever came up with this frightful creature - it is truly horrifying. The six foot tall She-Demon Man Eating standing prop is covered with blood and busy tearing apart a severed hand which appears to have been bitten off an unsuspecting human victim… Nasty! *Warning: This creature may be a bit too graphic for younger guests! Item Dimensions: 60-inch (150cm) tall x 24-inch (60cm) wide x 16-inch (40cm) deep metal frame base.